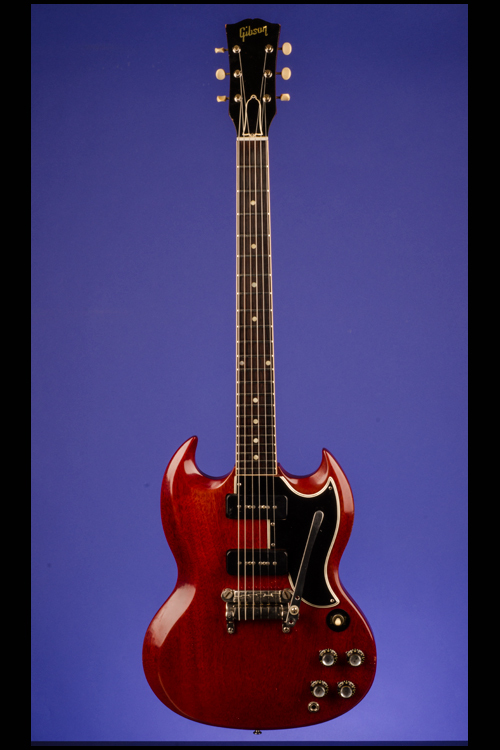 SG Special Guitars | Fretted Americana Inc. This 13-inch-wide, 1 3/8 inches thick SG Special weighs just 6.90 lbs. 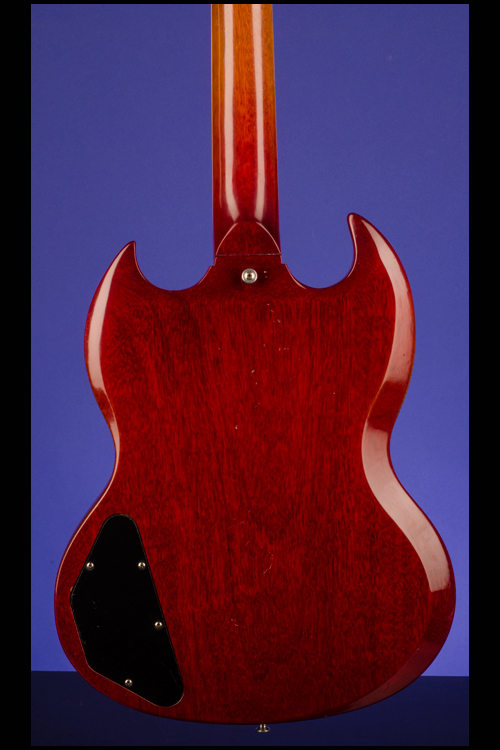 Solid mahogany body with beveled edges. 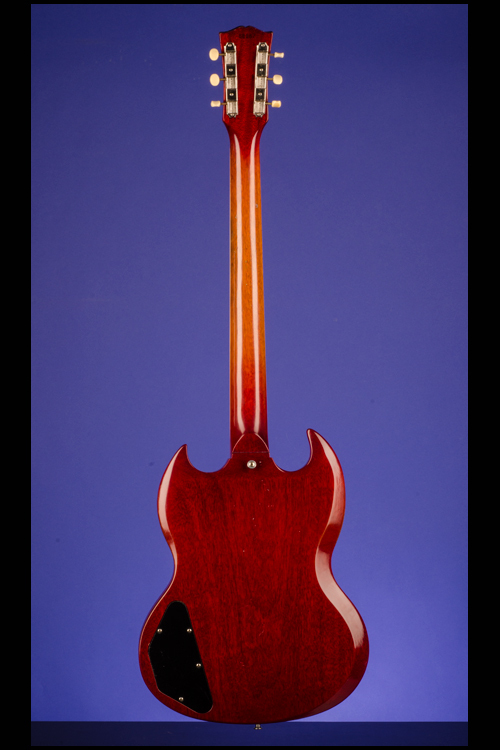 One-piece mahogany neck with a nice, fat nut width of 1 11/16 inches, a very fast thin profile and a standard Gibson scale length of 24 3/4 inches. Rosewood fretboard with 22 original jumbo frets and inlaid pearl dot markers. 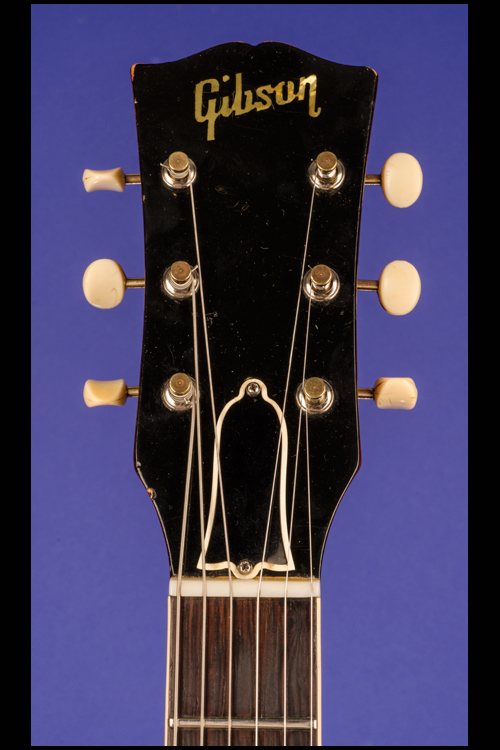 Inlaid pearl "Gibson" headstock logo and 'bell' shaped black over white plastic truss-rod cover with two screws. Closed-back Kluson Deluxe 'single-line' strip tuners with white plastic oval buttons. Serial number "58867" stamped in black on back of headstock. 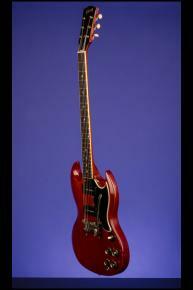 Two P-90 pickups with outputs of 8.43k and 7.83k. Five-layer black over white plastic pickguard with five screws. 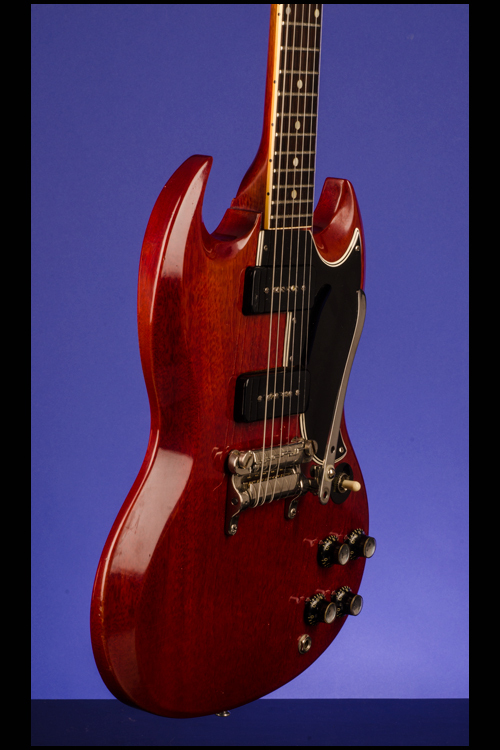 Four controls (two volume, two tone) plus three-way pickup selector switch. Black plastic bell-shaped knobs with metal tops. The potentiometers are stamped "134 6202" (Centralab, January 1962). 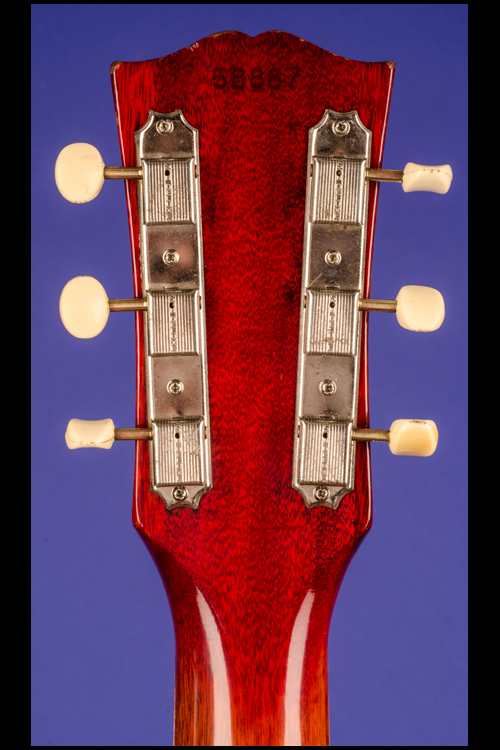 Wrap-over pre-compensated, intonation adjustable, bridge/stud tailpiece. 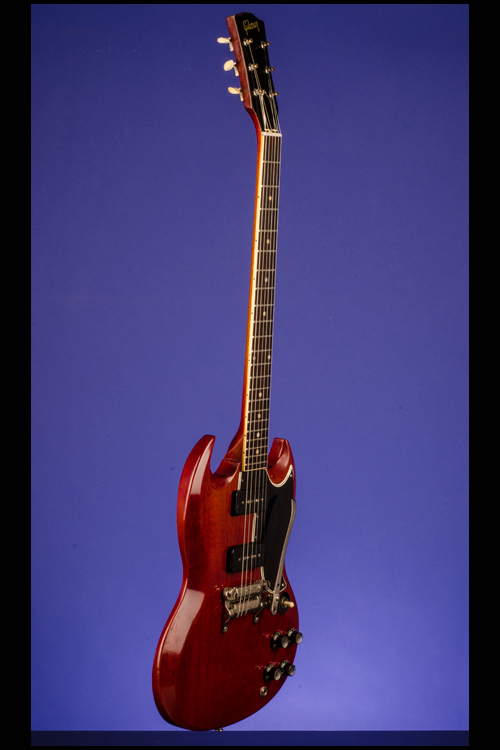 Gibson 'Maestro' vibrola with flat-arm. All hardware nickel-plated. 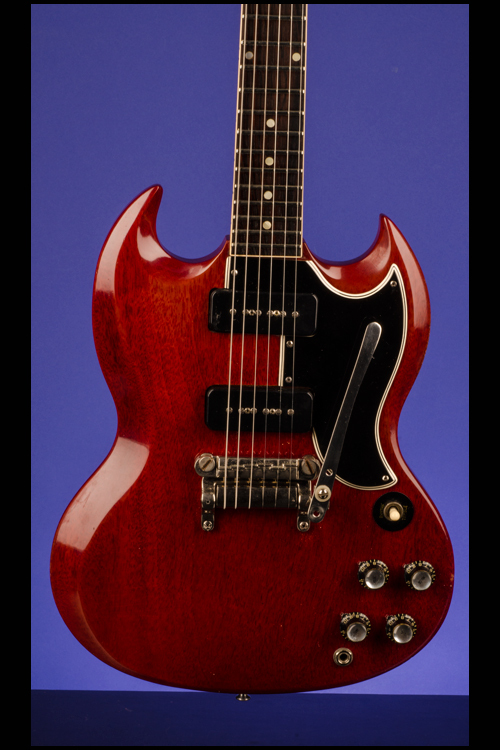 This wonderful fifty-two year old SG Special is in exceptionally fine (9.00) condition with just some minor belt buckle rash on the back (nothing through the finish), a few very small and insignificant surface chips on the body edges and some fading to the back of the neck. 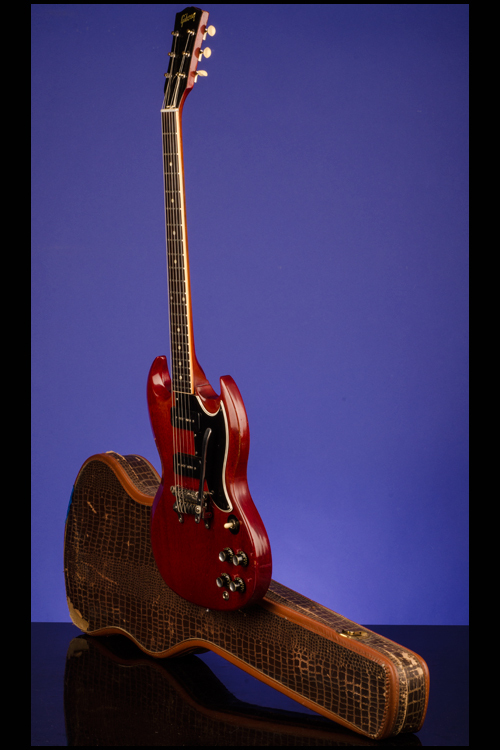 Housed in the original Gibson three-latch aligator soft-shell case with brown felt lining (8.75). The Les Paul Special was introduced as the TV Special in 1955 as an intermediate model between the regular Les Paul guitar and the lower-priced Junior and TV Junior instruments. The Special underwent two successive body redesigns in 1958 and 1961, while the Les Paul affiliation was discontinued in late 1962. 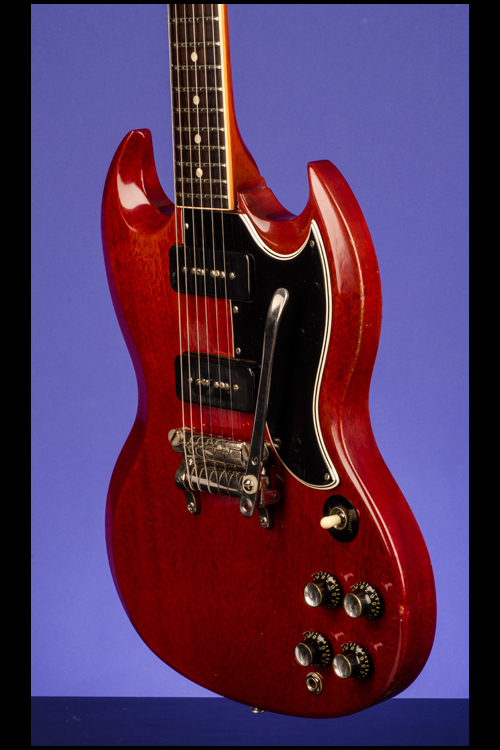 The model was then renamed the SG Special without any apparent changes in the specifications other than the removal of Les Paul markings.